Ah, the holidays: they’re either the most wonderful time of the year, or the most challenging. 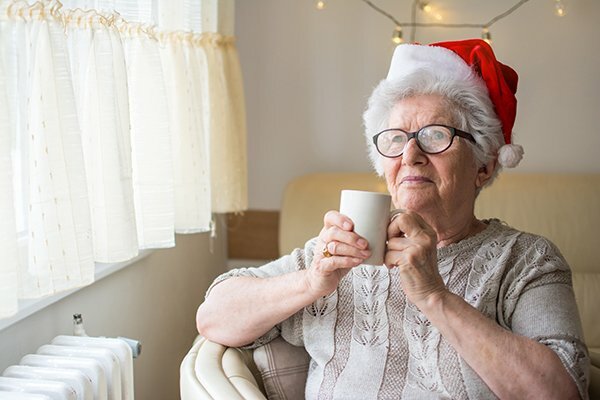 For many seniors who have lost loved ones, are struggling with chronic medical conditions, or are going through isolation and loneliness, it’s natural to experience some level of depression during the holidays. And, the family caregivers who take care of a loved one can also be susceptible to holiday blues, because of the excess of stress. Seek medical help. First of all, it is important to pass along any suspected signs of depression during the holidays (changes in sleeping and eating habits, lack of interest in previously enjoyed hobbies and socializing, sluggishness and persistent sadness) to your senior loved one’s (or your) primary care physician. There are excellent treatment options available, and it’s critical to rule out any other health concerns. Make healthy choices. With so many high-fat, high-sugar, high-salt food products available through the holiday season, it’s very easy to let a balanced and healthy diet slip and overindulge. But eating unhealthy, along with consuming too much alcohol, can add to feelings of depression during the holidays. It is also essential to have lots of sleep; 8 hours is most beneficial for most adults. Initiate new traditions. Often for older adults, holiday traditions have had to be modified as time passes. Starting a new normal is not usually easy, but can lead to restored interest in holiday activities. Try joining in a night of caroling, a shopping and lunch excursion at a brand new venue, going to a local high school’s holiday play or performance, etc. Reminisce. Rather than avoiding emotional talks about lost family members or past holidays, invite the senior to talk about memories, and take enough time to pay attention and be involved in the discussion. Looking through pictures or watching home movies can help the individual process the loss and begin to move ahead toward acceptance and peace. Help others. Nothing improves our state of mind quite like knowing we have helped somebody else. Look for opportunities for your senior loved one to volunteer in some way to help out those who are in need: baking cookies for a local homeless shelter, buying small toys and gifts to give to the children’s hospital, putting together care packages for people in the armed forces, etc. For additional strategies to inspire your elderly loved one to remain active and engaged through the holidays and all year long, email Heaven at Home Senior Care’s Grayson home care experts. Our fully trained caregivers serve throughout the Dallas-Fort Worth area, and are skilled in helping senior loved ones live life to the fullest, and we are here for you with as much or as little assistance as necessary. Contact us online or call 866-381-0500 to find out more.